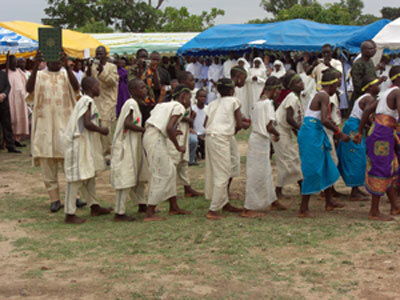 On the morning of 20 May 2010, four months after the death of Bishop John Moore SMA, crowds gathered at the field of the Immaculate Conception Secondary School, Bauchi. There had been heavy rain the night before and that morning, there was fear the ground would be ruined and muddy. No fear the ground was so dry the rain had run off, the banners and bunting were flying high, the awnings to protect people from the sun were up and the seats were out. The rain had cooled the air somewhat. Most people decided Bp John was still looking after them. As we arrived at the school, Scouts and Students were there to welcome us and show us where to go. Three groups of Knights – those of St John, of St James and of St Mulumba – were ready to line the route to the altar. A beautiful Mass programme and booklet of condolence was available with messages from the length and breadth of the diocese. The most poignant was from the staff of Bishop’s House which simply read “Huta Lafiya Baba”, translating as Rest Well Papa. At 10 am the procession to the newly built altar started with 300 Priests, 6 Bishops and 2 Archbishops. Most Rev. Matthew Ndogoso of Kaduna represented the Catholic Bishops Conference of Nigeria (CBCN). The Principal celebrant was the Most Rev Ignatuius Kaigama, Archbishop of Jos (of which Bauchi is a suffragen diocese) and Apostolic Administrator of Bauchi Diocese. The guests of honour had already taken their seats, including His Excellency the Irish Ambassador, Mr Kyle O’Sullivan (pictured above with Fr John Keane SMA); the Anglican Bishop of Bauchi, Rt Rev Musa Tula; those representing the Governor of Bauchi State, Deputy governor of Plateau State and the Papal Nuncio. 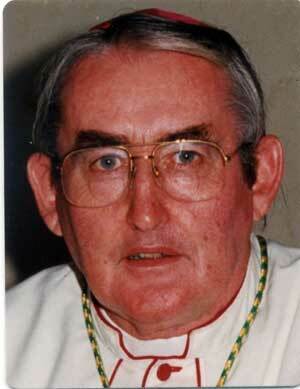 The honoured guest was Gerard Moore the brother of Bishop John Moore SMA. The Mass of thanksgiving for the life and missionary work of Bp John Moore SMA proceeded: two and a half hours of praying, singing and dancing. A celebration of a man loved, valued and respected. A man committed to Nigeria and its people. The excellent sermon given by Bp Oliver Doeme of Maiduguri reflected the love and respect Bishop John was held in: the sheer joy of life he shared with all he met, the richness of friendship he offered to all, not least the other Bishops of Nigeria. Two of the highlights of the mass were the Procession with the Gospel Book (above) and the Offertory Procession both led by young people dancing in traditional costume, with wonderful inate grace. 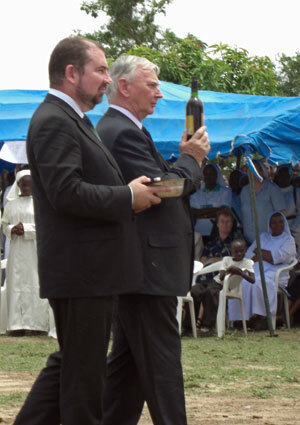 The bread and wine were brought up in the Offertory Procession by Mr Gerard Moore (on the right in our picture below) and Ambassador O’Sullivan. We have been truly blessed to have known him.